New research by Los Angeles-based architects Brooks+Scarpa is currently on view at the Verle Annis Gallery at the University of Southern California School of Architecture in L.A. The exhibition, Salty Urbanism, presents a case study approach for how two communities—the North Beach Village neighborhood in Fort Lauderdale, Florida, and Venice in Los Angeles—can plan and respond to the increasingly present dangers of sea level rise and global climate change. According to the architects, nearly 50% of the U.S. population lives within 50 miles of a coastline, a fact that is increasingly relevant as hurricanes, tidal floods, drought, and other climate change-related events associated with changing sea levels begin to increase in frequency. For this reason, Brooks+Scarpa argue, the time is right for designers to begin to put into practice “best management approaches” that had previously been considered largely on a theoretical basis. 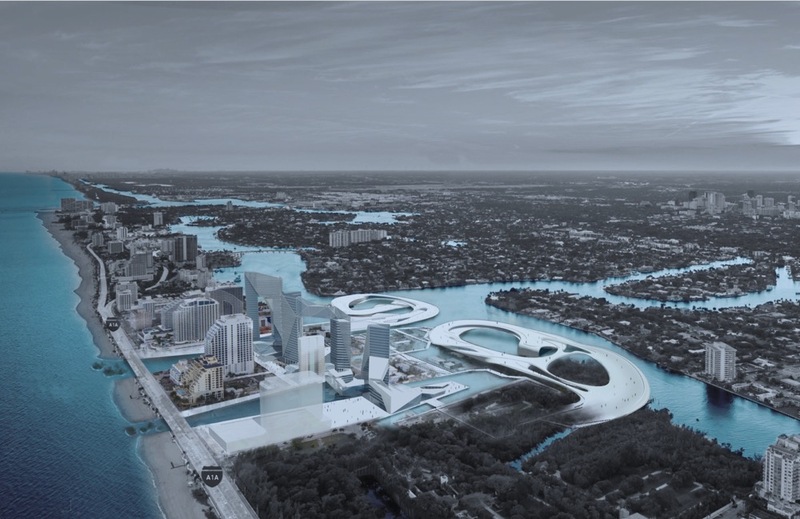 The exhibition collects speculative proposals as well as pedagogical perspectives for how architects might work through interdisciplinary means as part of a wider effort to stem the negative impacts of sea level rise on the built environment. They address the expected loss of water storage capacity for urban soils, as well as propose interventions to ease the future burden of legacy stormwater infrastructure systems. The exhibition highlights low-impact development, green infrastructure, and other alternative concepts as possible approaches for mitigating the damaging effects of climate instability in urban areas through a series of speculative proposals that include renderings, diagrams, and other visuals.